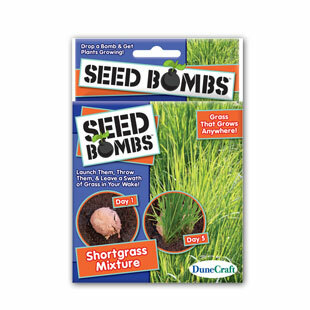 Throw, drop, or place your Seed Bombs anywhere you want to add some green grass. No crushing or stomping on the Bomb is necessary. Just water the Bombs or wait for the rain to fly. The specially developed clay and peat used in making the Seed Bomb traps moisture for the seeds when they need it most and protects the seeds from birds, animals, and other predators. Each Seed Bomb will cover about one square foot with green grass. Seeds are rolled in clay for protection and moisture retention. Exciting to watch as seed plants sprout, grow and bloom. Makes a great gift for gardeners, bird watchers, etc.